WASHINGTON (AllPolitics, Nov. 26) -- Defense Secretary William Cohen intervened to allow the father of a GOP congressional aide to be buried at Arlington Cemetery, over the objections of top Army officials. Robert Charles, chief of staff and general counsel to the House National Security Committee, wrote Cohen last July after the Army refused to grant a burial site for his father, Roland W. Charles Jr., who served two years' active Navy duty in the 1950s and six years in the reserves before receiving an honorable discharge. Army Secretary Togo West wrote Cohen in a memo that Roland Charles didn't qualify for an Arlington gravesite based on his service. He warned that for Cohen to intervene would be "potentially precedent-breaking" and "a big deal for veterans." But Cohen nevertheless asked West to reconsider the Army's decision, and he met personally with the GOP aide and the cemetery's director on July 24. That same day, West reversed his decision and granted the burial. 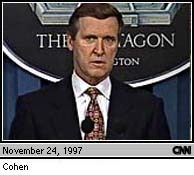 Cohen spokesman Capt. Michael Doubleday said the defense secretary did not overrule West's initial decision to deny the burial. "Secretary West made the final decision," Doubleday said. A letter from West to the leaders of several veterans organizations and obtained by CNN said, "The fact is, that Secretary Cohen's incidental involvement in the case played no role in my final decision." Charles, the GOP aide, maintains none of this would have been an issue but for an unexpected freak of nature. 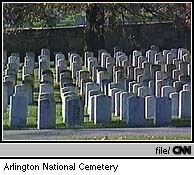 Roland Charles' parents are buried at Arlington, and cemetery guidelines would have granted him a burial at their site. But, tree roots have grown over the area, making new plots impossible. These revelations come to light on the heels of allegations the Clinton Administration intervened to allow Democratic donors to be buried at Arlington. Those charges were subsequently disproved. Charles says he didn't seek special treatment from Cohen but "a fair hearing on the merits." Still, he regretted writing Cohen on official government stationery and said his emotion over his father's death may have clouded his judgement. "My father always expected he could be buried at his father's grave site, and it wouldn't have been an issue except for the tree roots," he told The Associated Press. West and a spokesman for Cohen, in interviews with the AP, said the reversal was based on compassion for Charles, not on political considerations. However, several Pentagon memos on the matter obtained by the AP refer to Charles' congressional post.